This summer I had plans to improve me; I wanted to learn something new. Since anyone who knows me would tell you that I can barely draw a stick figure, I thought it would be fun to do some art lessons. It was also a good time to check out a homeschool art curriculum that I could use with my girls. 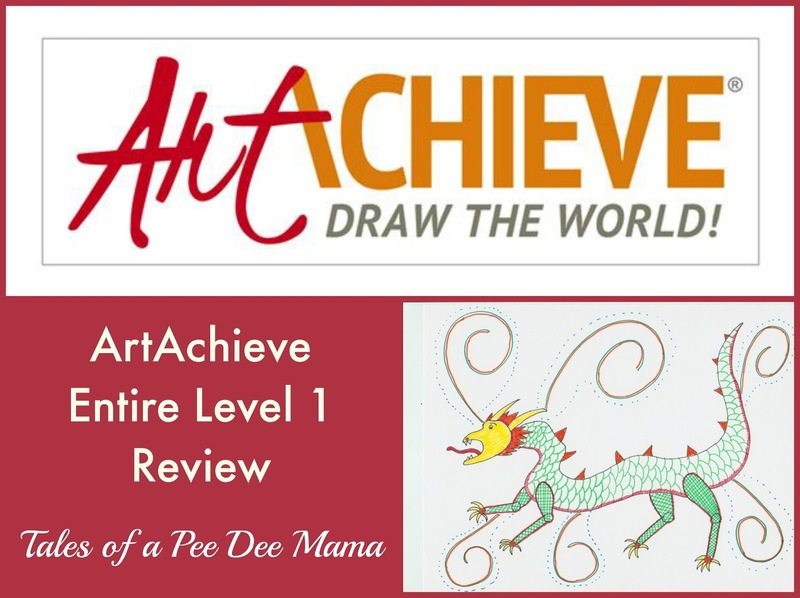 I thoroughly enjoyed the lessons from the Entire Level I bundle from ArtAchieve and can't wait to use these lessons with my girls this school year. 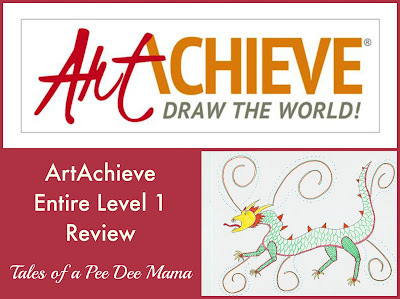 For this review, we received one year access to all of the lessons in the Level I bundle on the ArtAchieve website. This includes 11 lessons. Like I said earlier, I have NO artistic ability whatsoever. In fact, it was a standing joke in my botany co-op class whenever I would draw something on the board to show what we were talking about that I teach the science class and not the art class for a reason. ArtAchieve lessons, though, are so easy to follow and understand that even I was able to produce some decent artwork. The PowerPoint is simply a written, visual version of the video lesson. I didn't use this much because, while I am fully capable of following written directions, I do much better with auditory directions. I know my girls will also do better with the video lessons. The PowerPoint and video lessons give step-by-step instructions for drawing the item in the lesson. They also give background information that goes with the lesson. For example, in the lesson on The Haitian Gecko, they teach about geckos and where they live. 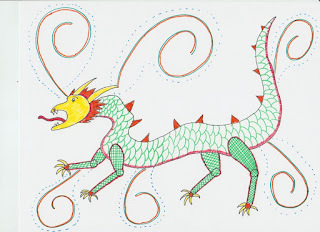 They also teach about how the people of Haiti often cut metal into gecko shapes and paint them. The printable warm-up activity involves copying sets of lines from one box to another. Usually it is a scrambled version of the object or theme of the lesson. The instructions for the warm-up say to remind yourself of what kind of line you're drawing as you are drawing it; I found this extremely helpful. The printable example of the lesson was good for giving me a baseline for how to draw what I was supposed to for the lesson. For me, one of the best things about the lessons wasn't the instructions; it was the "Rules for Drawing" given at the beginning of the lesson. The reminders that it's okay not to always like what I draw, that it's a process and what might look strange in the middle of the lesson might look better when it is completed, and that I need to draw for myself and not anyone else were all extremely helpful in keeping me focused on why I was learning to draw. It wasn't to impress anyone but to help me learn something new. 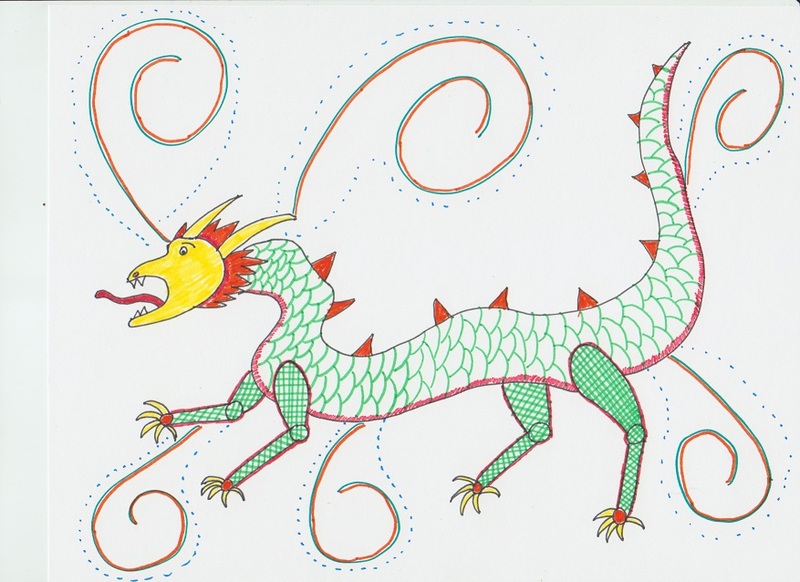 By the time I got to the lesson on The Chinese Dragon, I was really beginning to enjoy myself and my final products. In fact, I don't even mind sharing this one with all of you. Ha! Ha! Are you interested in what others have to say about ArtAchieve? Check out more reviews from the Schoolhouse Review Crew.